Ambush Predator: "Overreach? What Overreach?" 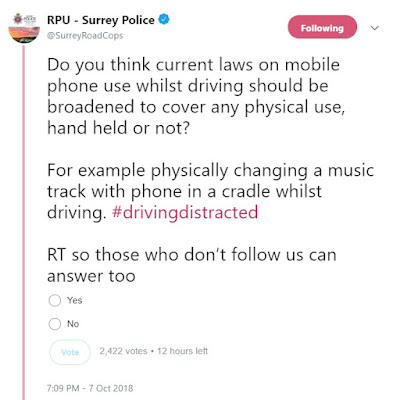 Why not go the whole hog and demand radios are taken out of cars (including police and other emergency vehicles)? Labels: control freakery, mission creep, motoring, police out of control, wtaf? The next thing they will want is no talking to passengers by the driver- that is a bigger distraction similar to having arguing kids in the back. My stepfather died at the wheel, whilst arguing with my mother (who was seriously injured in the crash). But I do not agree with more bans - we have too many already. Are you pleading ignorance of the Plod angle, JuliaM? Surrey Filth recently hit a very rich gold vein with their new High-View 'Supercabs'. The latter facilitates close surveillance of driving wells together with wide-lens filming of your vehicle interior. The films are later scutinised with the object of trawling the 'evidence' to maximise the number of 'offences'. 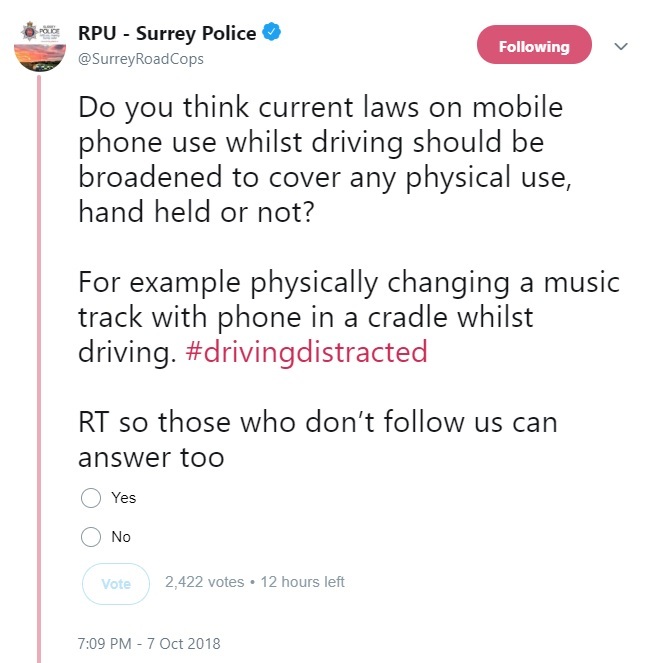 Surrey Plod's monthly tally now amounts to thousands of Fixed Penalty Notices for 'distraction driving'. The 'demands with menaces' are as good as a licence to print money and the plod tally has been further increased with new searches for vaping equipment, sweets, confectionery and sat-nav activity. It is a scam masquerading as a road safety initiative. We have all seen law enforcement hypocrites ignore the rules themselves...the 'enforcement' is focused upon revenue generation from the pockets of motorists. Got it now, JuliaM? RPU officers manage to speak with their control rooms whilst driving? Perhaps telepathy is now a requirement for recruitment? Pity it's not hindsight. "The next thing they will want is no talking to passengers by the driver..."
I honestly believe they'd lobby for that if they could. "But I do not agree with more bans - we have too many already." That attitude is rare these days - cherish it. "It is a scam masquerading as a road safety initiative. " Yet they don't see any of that money, do they? Doesn't it have to go back to the Treasury? "Perhaps telepathy is now a requirement for recruitment? Pity it's not hindsight."